With a four point night against the New York Rangers on Friday, Leon Draisaitl climbed a bunch of spots on the NHL scoring list, moving into a tie for No. 20 overall with 26 points in just 20 contests. It’s been crazy. After a year in which everything went wrong, things are suddenly going very, very right. So right that when Draisaitl looks at the NHL scoring list, he can see Alex Ovechkin (25 points) and Sidney Crosby (19 points) in the rearview mirror. It certainly has. This is a little like Eberle’s big year in 2011-12 in that there’s obviously a very talented player driving the results but there’s some lucky wind in those sails, too. Draisaitl has nine goals on just 44 shots; it’s generally pretty hard to sustain a 20.5 shooting percentage. That’s not to say he doesn’t deserve a break, as last season he shot at just a 4.1 percent clip, but it is to say that we should expect the goal-scoring to cool off a little bit. Unsurprisingly, Edmonton’s on-ice shooting percentage as a team is high when Draisaitl’s on the ice, leading to lots of goals to get points on. He’s also collecting a point almost every time his team scores a goal; that’s often something that even really good forwards struggle to keep going long-term. Get to the Good Stuff! Yes, everyone mentally setting this as the new baseline for Draisaitl is likely to end up disappointed in the not-too-distant future. That’s not the point. The point is that even after pessimistically cutting down his shooting percentage and his on-ice shooting percentage and recalibrating for his inflated individual points percentage… this is a staggeringly good season. 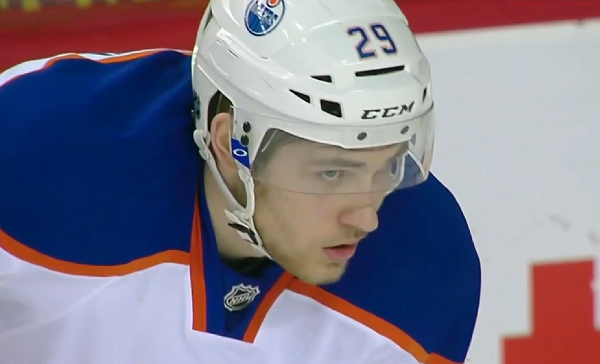 Imagine a pessimistic world where one-third of Draisaitl’s points vanish in a puff of smoke. Even in that world he’d have 17 points in 20 games, putting him on pace to top 70 points over a full 82-game season. All of a sudden he’s a big, fast, strong centre scoring at a 70-point pace at the age of 20 while playing tough opposition. That’s an incredible player; after all, Evgeni Malkin and Ryan Getzlaf were 70-point players last season. They don’t exactly grow on trees. Draisaitl is visibly faster than he was a year ago. His strength against established NHL’ers is so obvious as to be impossible to miss. His playmaking ability is so good that comparisons to Joe Thornton are not crazy. He plays a shockingly mature defensive game for a player of his age and experience level. That’s a fantastic combination of attributes. His on-ice shot metrics (Corsi and the like) look really strong, too. 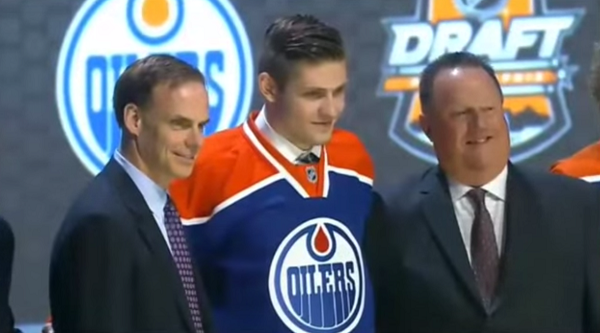 After a tough 2014-15 season, Draisaitl could have gone a number of different directions. Another poor campaign would have raised questions about his future and had fans pining for someone like Calgary’s Sam Bennett. Instead, he’s come back strong and given Edmonton the kind of centre depth it hasn’t seen since Glen Sather was general manager. All this probably sounds a little breathless, maybe a little over-the-top. It should sound that way. Draisaitl is so far past any reasonable expectation of what he’d look like in the early going this year that it’s hard to overstate things. It’s probably not quite on par with the Oilers winning the Connor McDavid lottery in terms of franchise impact, but it’s perhaps even less likely. At some point, we gotta admit that maybe Eakins wasn’t the answer. TMcL learned in 15 games how to make proper lineups and command / reward performance. I knew there was a problem with Eakins when he took away the donuts. Eakins, was out to prove he was smarter than everyone else. Those situations rarely end well. TMac has been a breath of fresh air ….. And yes, I thought that before the recent home stand. This team still has warts but suffice to say, coaching isn’t one of them. (Except for leaving Schultz on the powerplay ….. But I digress). Eakins wouldn’t have been in any position to assert his smartness if it wasn’t for genius Craig MacTavish. Not only was MacT out to prove himself smarter – – – he didn’t want anyone around with a lick of smarts to show him anything lest he get replaced with them. (Stupid people hire stupider people). Sweet….and I might add…Stultus est sicut Stultus facit….stupid is as stupid does. This may seem like an odd question but do you like Bacon? LOL….yes the Great Donut Caper goes down in NHL history….lol….did you know if you spell Dallas Eakins backwards…co-incidentally…is looks like SNEAKY SALAD…snikaE sallaD…..lol…just saying.It was more than the donuts/sallaD it had “a little something” maybe to do with the Sneaky/snikaE parts, and it was pre-destined and pre-written…..lol. Ryan Smyth made a couple of comments this week about Eakins clearing out of everything honoring tradition the Oil had in the dressing room. I was shocked Lowe/McT let him come in and show such total disregard for the Oiler tradition. Having Eakins in Edmonton was the equivalent of ‘barbarian’s at the gate’. Smyth also referenced last year’s commemoration of the ’84 to ’04 teams and the missed opportunity to pass on tradition to current players. Clearly Eakins resented the former dynasty. Teddy Purcell’s uptick is really something. He is a highly complimentary player right now. Hall has credited Purcell a couple of times for the puck plays he has made and how he fits with Drats and Hall. My cynical side wonders if he is amping things up hoping for another contract. My hope is the coaches are helping him and he stays on a value contract for maybe 2 years tops. Rehabbing some flawed performers may say more about coaching and renewed development strategies. See Kaira, Pekarinen and the young D.
Draisaitl’s hot streak partly benefited from poor outing last year. Most of the team’s scout report were on how was like last year compare to this. He will cool off only when other teams start to pay more attention to him. However as the way he is playing as for now that if he can keep it going until McDavid’s return then even when he will eventually cool off that it will still remain to be the nightmare for the opposing teams to match all 3 lines of McDavid, Draisaitl, and Nuge. The sky’s the limit with McLellan behind the bench with this bunch young hungry lions. now can we get another legit Dman out of -3 Eberle. What a waste of 6M. If he wants to stay here at end of his contract than he needs to take a healthy pay cut. We have to be patient….yes I said it. If Yakupov looked like a legit top six forward on McDavid’s line before McDavid got hurt…can you imagine what a healthy Eberle would look like beside him? The odd man out is RNH because you can’t have a $6M 3rd line centre. It kills me to type this but if Leon maintains his chemistry with Hallsy and McDavid develops some with Eberle, then RNH and Yakupov are your chips to get one super awesome D man or 2 decent top 4 D men. any one can play with mcdavid. Yak at 2.5m is more preferential than Eberle at 6M. Eberle can still get you an asset. At least until the league finds out he is not that good, and super soft. Nuge is not the odd man out. A high possesion defensive line can be built around him. He is better, bigger, younger, harder and on a better contract than eberle. You do not trade him. And why wait for eberle to develop cheimsty with mcdavid, yak has it. And the media and everyone else will say it is all mcdavid so we get yak for cheaper. If eberle get more points he is going to want 7M with his new contract. Eberle is not a winner, he has never been on a winning team. Playing for team Canada does not count. You are expected to win and the team is stacked. Yak is not as good as Eberle (and never will be) plain and simple regardless of salary. My money is on Eberle and McDavid tearing it up in the back half of the year like Hall and Leon are. McDavid centring Pouliot and Eberle will be a very strong 2nd line behind Leon, Hall, Purcell this season. didnt say yak was better than eberle, said it was more preferential. How do you expect to pay all these guys in a few years. We need to shed some contracts. And Eberles is the worst value by far. I’d rather have Khaira with McDavid and Eberle. Pouliout is the softest big guy as they come. Plus Khaira can fight and protect his linemates. He’s not a winner even when he’s the 2nd highest scorer with the best +/-on a stacked team? What’s he got to do to win, then? By your measuring stick Hall, and even McDavid (the team is sub .500 with him in the lineup) are losers too. Yak got points by making plays at his own blueline mostly. Completing the breakout, and then McDavid goes down and scores. A lot of the guys in the league can play that role. Ebs would really flourish in the offensive zone, capitalizing on the space that McDavid opens up, much much much more than Yak. Yak is on pace to be outscored by Korpikoski, Pakirenen, Hendricks etc etc. None of those guys have Ebs’ offensive abilities. If Eberle keeps up his current scoring pace, he won’t break 30 points. If he scores a point per game for the rest of the season, he won’t break 60. At some point the Eberle fan club is going to have to accept their hero isn’t bringing it. Scoring at a 0.41 ppg pace, he doesn’t deserve to play with McDavid. But even though he hasn’t produced, I would still give him some time with McDavid. Let him score some goals, get some assists, pump him up so you can trade him in the off-season. Then Chiarelli can bring in a player that plays heavier, at a lower $AAV. Sigh. If if if. What’s more likely here? That a player who has put up an average of 0.8 PPG over their career suddenly and irreversibly scores at half that rate – or a player in his offensive prime comes back from a shoulder injury and scores closer to his career average? Also, if he score at a point per game (52 points + his current 7 points) for the rest of the season he would finish with 59 points. Quite frankly 59 points over 69 games is actually an incredibly good stat line these days. Why exactly does a guy who puts up points pretty much exactly in his price range not get a shot with McDavid? Uh ok, yeah, just dismiss a guy who is probably going to average 65 points for the next bunch of seasons. 28 players last season scored 65 or more points. Less than one player per team. Jordan Eberle didn’t create this patchwork defence. Jordan Eberle didn’t give us these goaltending issues. 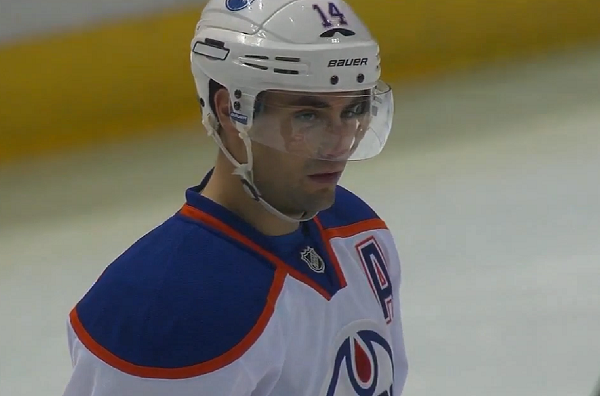 Jordan Eberle didn’t hire Dallas Eakins. Jordan Eberle has only done exactly what has been asked of him, in fact, exceeding expectations for someone taken 22nd overall. 60 point guys are a much harder commodity to find in the NHL these days than you might expect. If we could get a legit number one D for Ebs? Sure, I’d even give up Nuge for that. Eberle is the most expendable of the offensive stars, but let’s not pretend he is somehow a bad player for some reason. But it’s always typical in Edmonton – your only good players are somehow responsible for the awful play of your bottom 6, defence, and goalies. Since calling out for a Hall trade is impossible now, I guess Ebs is the new whipping boy. 1) He has never scored a point per game, so 59 points is fairly optimistic. If he makes 50, he will have turned around his brutal start. 2) He is the most expendable. If you can move him to strengthen the team, then you look at it. 3) The defence has been bad for years, and that’s not on him. Outside of Nilsson’s strong play, goaltending has been weak, and that’s not on him. He is paid big money to score and he’s not. He is not an all-around player, so when he doesn’t score, he’s not bringing anything else. This isn’t the MacT era; so he shouldn’t just get a key spot just because fans remember his play in previous years. FIRST: League Right Wing Rankings: TSN @ 17, NHL.com @ 17. There are 16 ahead of him but based on 4 per team, 103 behind him. Based on these numbers, the fact that Eberle is relatively young (i.e. will likely improve), has always played against top 2 D as we had no one else (until now) so his numbers are hard earned I would suggest we all be thankful for such a talented player. FINALLY: We are relatively weak at RW after Eberle with Yakupov and then Purcell so if we are stupid enough to move this talented player, then what? Sorry. I keep RNH, as he is a very well rounded 22 year old center. When McD is back I would run Hall-RNH-Drai for a good stretch. This line would draw the tough matchups and top D and the world becomes a lot easier for a Pou-McD-Ebs line. Drai can certainly play C but with his size / speed and ability to make plays from the off-wing I would argue he is more dangerous as a winger. Think of how many goals have come from Drai making a play off the right side wall and then dishing some backhand sauce to Hall or steaming in from the off wing. RNH is an incredibly subtle 200′ player who thrives on good players. Plus he can skate with these two. He strips pucks from the opposition as well as anyone. Draft good players. Keep good players. Until you are forced into a move by the salary cap, RNH would stay on my team. Honestly when McD gets back I think you first have to give it a shot with all 3 at C if everyone is healthy. but if that fails to get all the lines going then you do as you said and stack the top two lines – no trades, until cap forces it. If all three at C works you are laughing. All of a sudden Drai, Nuge, and McD are each playing 16-18 minutes a night like Drai and Nuge right now. Also a nightmare for the other coach. One of those lines will be firing on all cylinders each night. RNH is what he is and people should not over-value him. A 50ish point player when playing 1st line minutes and getting pp time. If he is relegated to 3rd line minutes wo much PP time point production would be lower. Agree that 6M for a 3rd line center is not long term sustainable, although it likely won’t be an issue until the 2018 season. If you noticed there has not been a trade this season that has involved roster players at the NHL level so I doubt we will see any big name trades, it just doesn’t seem to happen anymore. If RNH is a third line centre we will have a pretty good team and still not have cap issues. Actually, don’t we already have cap issues? McDavid, Yak, Pouliot and Ferrance are all on IR $12M+ ??? Are these contracts already included in cap? You know that whole chemistry thing? I think the attributes that Yak added to that line are exactly what that line needs. Willingness to hit, willingness to take a hit to make a pass, shoot first, put the puck into open space. There was something amazing about those three together. 77 trashes so far, its comical how emotional most people are here. Drai is going to command atleast $6mil when it’s his turn to sign. Some quick basic math in a salary cap world will prove to anyone that you can’t have $6mill third liners. Maybe it will be Eberle, maybe it’ll be RNH, mabye someone else… The facts are something will have to give on this team eventually. I wish it didn’t, but the Oilers are and will be subject to the cap just like everyone else. Ok, I’ll bite, name a D that you can get from Eberle and also name which D that you are willing to take out of the roster? As for now, Klefbom and Nurse are both still a bit raw but they are showing every signs that they are ready for top pairing jobs. Sekera is settling down and play quite solid games. Davidson and Gryba are low pairings that can be easily rotated. With this understanding that the only spot available is somewhere mixing with Nurse, Klefbom, or Sekera. Unless that you feel strongly that they should also get rid of Nurse and Klefbom for the D of your dream? What page of the CBA covers pay cuts ? Relax. Ebs is a very good hockey player. He (and RNH) were showing some significant improvement the last couple of games until some tough matchups against Brassard’s line. Ebs can score. TMac will help him figure out his defensive deficiencies. Can we please see him on McDavid’s right side for 20 games or so before we run him out of town? A pay cut with his new contract. That is clearly implied in the statement. Eberle at 6M (7 in future) or yak at 4 in future on Connors side. HE is being run out of town because of 6 years of soft play and a bad contract. 20 games on connors side? You mean at 6M he cant do anything on his own? Stop being in love with all these players. We need to fill the gaps where there are holes. ASk your self is this team better now and going forward with Eberle at 6M or Hamonic at 3.9. Yes I know the islanders dont want that trade, but something could be put together around it. What new contract you are carrying on about? Ebs’ contract runs for three more years AFTER this season. He is not a perfect player – but he can score. He has proven that year after year. Something that is at a premium in this league. Sure if you can get a 25ish top pairing D man – great. But I don’t see it happening. He is what, 18 games removed from a major injury? Let’s see what his value is after 20 or so games with MacD. I am not saying moving Ebs or Yak at some point is wrong. Selling low is a mistake. A BIG mistake. Until 20 games ago there were many saying “move Leon for a defenseman”. Would that have been smart? I agree he was invisible last night. I would like to see him for Wayne Simmonds. Except Simmonds went -3 last night as well, what a waste of money there as well. Willis is wrong! Let’s raise our expectations for this pace of scoring to be the norm from him! When he fails to live up to the hype we should run him out of town. I’m only glad he’s found home next to Taylor “terrible attitude” Hall. Draisaitl has been able to drag that plug of a winger along with him, to a top 5 scoring place in the NHL…. Any way, now that Draisaitl has emerged as Anze Kopitar on offensive steroids, we can trade that ‘soft two way’ 22 year old Center who also on pace for over 60 points. Things are only looking up as long as the Oilers keep winning! When they turn bad again, we can run all these kids out of town in HF boards trades for Shea Weber and PK Subban! Great article. Drai is scoring in the range of these other players because he is as good as these other players. Fantastic talent. Yes he may have cold nights but so do all, it’s not fluke, he is for real. Great blog on Hall yesterday as well. It’s time everyone stops prefacing their comments with “they are still a bad team but….” Or “this not sustainable but….” I notice so many bloggers and posters so gun shy they are scared to believe . This is a good team, growing every night. Injuries have become a blessing in disguise. Drai emerged from under Connors pre season shadow. Management has looked and re evaluated every player and most prospects. Now the building of lines and chemistry looks to be coming together. Exciting times ahead. As Johnathon points out, his point stats overstate his goodness. He’s a very good player – maybe he will develop into a great player. He is on a great roll. Ditto the team. In many aspects they are playing about as good as they can – at home at least. But they are still a below average team. That may be changing – let’s see what the remainder of December reveals. Well said. I wonder what nonsense all of these analytic gurus would have said about Gretzky and company, Orr, Richard. Someone has “out of the ordinary” success and you always have to bring it down. Will it last – who knows, but how about enjoying it while it is here. Who knows, you may be a witness to something special. But according to you, probably not. b….but….we were supposed to take Sam Bennett!! he was supposed to be the better player!! we were supposed to have blown it taking Leon!! Leon can do pull-ups with Sam Bennett hanging off of his legs. I know right? I’m just curious where are all the Flames trolls that said Bennett was going to skate circles around Draisaitl…. I don’t see any of those chirps in the comment’s section today. weird isn’t it how fast Leon is for a slow guy? Leon is ranked 118 in All Star voting this morning. Let’s change that. Go vote as many times as you can now! This 5 games winning streak has everything. Beating both Chiarelli and McLellan’s former team, beating the best team in the league. “Connor is better!” chant beating Eichel. Sather honored tonight with 80s style game by beating his current team. The ones we have remediated are now educated….to the rest….just tell them to listen for the Rolling Thunder…and they will have tme to either buckle up or turn it in and fold easy when they hear it…because NOW when they see the Oil-drop on their Calenders they will know that Something Wicked Walks This Way….lol. Just tell em all we’re coming….ALL OF US TOGETHER…and you dont know why, but it doesnt look good.lol. Why do people still want to trade our better players? The team is winning, the boys are confident, why not just enjoy the games? Also, it’s great we aren’t hearing any more “Should have taken Bennett instead” comments. Imagine what he’s gonna do again 2nd pairing dmen once Connor gets back!! Draisaitl doing as he seems to do with every league he went into . First year mediocer and then bust out big the second season . Ditto again this year . Size matters by the looks of it ! Ok, so the Nation has clearly agreed. No trades. Now comes the fun part. In three weeks when McDavid, Yakupov, and Pouliot are back, which lines go where and if any, what changes to you make to the forward lineups? Korp Letestu and Gazdic alternating in. Stick with a good thing and this point. Those lines are insane!!! Sure, let’s keep the hat trick scorer as our 13th forward for the rest of the season, sounds good to me. Everyone keeps talking about how we can’t keep Nugent-Hopkins behind McDavid and Draisaitl, but its the value roles I regret that are going to be moving out in trades and free agency that concern me. Yeah we’re going to have two to three really good centers playing in our top six, but who thinks we are going to be able to afford players like Hendricks or Korpikoski after next year, especially with the cap discussions ad nauseum about our top six. The reality is, our bottom half of the lineup is going to be made up of some combo of newish players (Khaira, Yakimov, I like Chase but his languishing in our C teams roster is telling) and value signings a la Stempniak ideally. Korpikoski has one more year left at 3M, if the Oilers are not in the playoff hunt come trade deadline(lineups at the kool-aid stand are long, not convinced we’re going anywhere this season yet), what do you think we could get for a LW that can play up and down the roster and fits within most cap rooms teams have for the year? Chase has been a pro for 2 months a d you can TELL what he is already! Wow you are one hell of a scout. Or is that moron? Again I like the guy, but for real here, if the organization thought he was anywhere near ready I don’t think he’d be bouncing around between the AHL and the ECHL. Are we stewing him in the ultra minors so he can make Bakersfield history or do you think he’s gonna make the jump from Norfolk straight into the Oilers ranks the next time they want to shake things up? He’s not blowing the doors off either league for any means, see for yourself. And lay off the name calling, I know plenty of morons who are great people. I’d do almost the same, but replace Khaira with Hendricks. So you will keep 15 forwards which leaves room for 2 goalies and 6 defence. One of the defence has to be Ference due to his no movement clause.. Sorry buddy but two more forwards have to go down. He has always been a fast skater as he won the fastest skater last year. It was his starts that were a little slower. Props. I predict (don’t be) “that guy” to weave it’s way into ON-ese, like FIST and SIUTB. Spector has an article about his skating coach up somewhere. Let the Flames and nucks fans worry about denigrating our players’ accomplishments. The kid’s an Oiler and watching what he’s doing every night on the ice is something we’ve waited for a long time around here. I remember people bitching that Bennett was ranked higher than Leon, that we took the 4th ranked skater with the 3rd overall pick. To that I say, HA. Guess Leon really didnt want to go back to Bakersfield!!!! Neither does Nurse. Neither does JJ. I guess none of us can sit and judge them – until we walk the streets of Bakersfield. Just imagine the # of comments and long winded theories. There might be a good possibility McDavid will return to action as a winger for a while , seeing as face offs could be hampered by latest injury . If that’s the case he is coming back too soon and I don’t see that happening. Good to see the trolls are out this morning. Poopypants, formerly known as soiled trousers, and his alter ego simmer, up to his regular garbage on trading our ‘soft’ players. What a clown. Without question, my FAVORITE New Age Sys comment, ever. I may get a T-shirt made with this question on it as a Christmas present to myself. I wonder if Lundquist is still so cocky and laughing about Edmonton after he got yanked last night. I don’t get why everyone can’t wait to see Eberle on Mcdavids wing. Yak was magic there, he looked confident and was making great plays. All he’s ever wanted was a skilled center he could gel with and whenever he’s been giving that he has looked like a top 6 forward. Eberle has a history of chemistry with Nuge and honestly hasn’t done anything this season to warrant exiling yak to the letestu line. Nail is a faster skater and plays a harder game, the chemistry was obvious before Connor went down to injury. Connor seems to know how to use Yak as the offensive weapon he always had the potential to be. Now if only Yak and Ebs both find a way to play with McD. Can either be effective on LW? Yak has played as a LW but by eye he seems to migrate to RW. That may be a lot of chaos for a rookie – even McD – to absorb. This line would be a threat to score ……. at both ends of the ice. Blah blah blah law of averages blah blah. Blah blah regression to the mean blah blah blah blah. When it comes down to it, all the credit belongs to Leon. He learned and grew from last year. He worked hard in the summer. He bounced back. And then he bounced back again after getting cut in camp. He’s a fantastic player. And he’s focused and performing well. Credit should also go to Taylor Hall and Teddy Purcell. Good chemistry. And of course McLellan and the rest of the coaching staff for obviously unlocking something in his game at the NHL level. What happens when everyone is healthy? I’m thinking we are just starting to see a team that is playing the system like a team………soon we will have too many players for positions. I thought we should have picked Bennet over Drai. The more he proves me wrong, the happier I am. I thought the same too at the time, partly because Bennett was being compared to Gilmour and Toews but mainly because of the bozos in charge at the time. Totally happy to admit I was wrong, Leon is a stud! Draisaitl may indeed be a stud. But we are a long way from passing judgement on how good Bennett is going to be. and most Oiler fans like me know this. i know that Bennett is a wonderful talent, but i am doubting that Bennett, Leon or Sam Reinhart will actually out perform the other during their NHL careers due to the fact i think they are equal in talent, in my opinion. Fair enough, Bennett is looking really good. But we drafted the right player for what we needed. Even if Bennett becomes an absolute stud, Leon fits better with where we were lacking. the only reason fans were so butthurt about us taking Leon over Bennett was because Bennett had been ranked #1 on some hockey lists and Leon never was so therefore we made the “wrong” choice. i couldn’t disagree more! the reason is that with Bennett, Sam Reinhart and Leon, you were getting fairly equal talents, but in Leon’s case a large center, which is what this team needed on the top 2 lines in like forever. with talent this close, there really wasn’t any “wrong” choice and in this case it was a good move in my opinion to take for “need”. Everyone talking about lineups after MacD comes back: players with good chemistry paired together. Pairs then fill in the blanks. RNH-Ebs (just cause they’re running a touch cold right now does not change the years they’ve proven to be a good pairing). I fill Purcell in with hall drai for obvious reasons. I put JJ Khaira in with MacYak attack because he can play, keep the cycle alive, and keep the opposing players honest. Our top line last year when Hall was injured as our ‘3’ line? Yes please. On the road the opposing coaches feed RNH ebs and poo super soft minutes and they flourish, and at home they take on the toughs leaving the other lines to dominate. The future is bright. What’s MacD’s timeline again? Agree with the pairing as does McLellan. Also was the same for Gretz/Kurri; Messier/Anderson. Filled in with different players over the years. Wouldn’t put JJ Khaira with Mac/Yak as too young a group. 2 rookies on same line is tough. Would put Purcell with Hall/Drai for now because it is going good. Purcell needs to be traded, still not impressed. Pouliot with Mac/Yak, and JJ Khaira with RNH/Eberle. Then have as your 4th line Hendricks, Letesiu, Pakerenien, with Korp and Klinkhammer as extras. Lander traded, or you put JJ Khaira back down and put Korp with RNH/Eberle and keep Lander as an extra forward. Re: Yak/McD/Khaira; I enjoy watching kid lines. They bring a ton of energy, and with the skill of McD, they would be fun to watch. Khaira had been able to skate at an NHL level, and can win a few battles. Plus he doesn’t back down from anyone. I’d try it a few games. I was not one who said that they should trade Drai. You shouldn’t move young blue-chip prospects. But I was one who thought he would benefit from a season in the AHL. Apparently Drai disagreed with me and showed he belongs in the NHL now. Heck, he and Hall belong on the All-Star team. And not because of the pity rule that forces the NHL to invite an Oiler. Because they’ve earned it. It’s been a remarkable 20 games. If we project that we push for the playoffs this year, make the playoffs next year and win the Stanley cup the following – 2018-2019, here are possible players to keep in relation to Salary Cap. McDavid, Draisaitl, Nurse agree to a bridge contract. Deleted from current poster are – Purcell, Korpikoski, Yakupov, Nikitin, Schultz, Ference and Fayne. 14 forwards, 7 Defensemen and 2 goalies for 23 man roster for a total cap hit of $74,147.000. Of course we could tinker with bottom of rooster regarding names, but the scenario indicted we can keep RNH and Eberle. 7M a year is pretty conservative for what McDavid’s next contract might look like, it’s the nature of contract sizes to inflate over time as the salary cap and league revenues go up. The number Connor will sign for at the end of his ELC will 8.5M/year or higher, with the oil or via offer sheet from another team. Or drai 5 if they play as well as they are playing now. Interesting that you have Reinhart as a bust. IOW there is no way the team can stay under the cap with the talent it has AND add the talent it needs. One or more of the stars is going to have to be moved. Lol Drai will take less than RNH playing above him on the C list, does that make sense? Try McD at 10, Davidson will be closer to 3 if he stops improving right now… Nurse has two and a half years left before he signs, he could very well be worth more than 4.1 then. Although I don’t mind MacT and think he was put in a position that 80% of decent hockey people would also fail at, it appears him getting overexcited and overpaying Nuge and Eberle will be the ultimate reason someone will eventually have to go. Ebs and RNH should both be cap hits of about 4mill right now, but because they’re not, it looks like one of them will be going in a couple years. McDavid, Nurse and Drei would have to accept a bridge contract much like Subban. Davidson could very well be worth 3M. Lots of different scenarios regarding the line up. All I was trying to show how tight things are. It is easy for Oiler Nation to say keep Yak, Eberle, RNH, Purcell, etc but they do have to fit under cap. Not all of our favorites would be able to be on the roster in year three when McDavid, Drei and Nurse entry level contracts are up. For all the complaints about lack of scoring in the NHL right now there are three players on pace for 100 points or more: Ben Seguin and Kane. And let’s not forget Taylor hall is currently 4th in scoring in the entire league. But fcku it trade that guy right? I don’t see why LD’s shooting percentage has to be unsustainable. He and Hall are passing the puck extremely well right now and between them they are forcing the goalie to cover too much of the net to have a real chance. As long as they can continue to slide through and around defenders these two are going to keep giving the other either a torn open five hole or a wide open half net to shoot at. Cite the example of a near ppg player who has the shooting percentage draisaitl has. Nobody can sustain it fr a season let alone a career.